Sister José Hobday's talents were vast. She was a sister of the Franciscan Order for more than 50 years. She studied education, world religions, theology, literature, architecture and engineering at several universities, and earned a master's degree from the University of Notre Dame. Hobday taught high school and college classes. She was the author of myriad essays and several books — she approved the galley proof for her last book just three weeks ago. As a sought-after lecturer, Hobday traveled the world speaking about spirituality. It wasn't unusual for her to log 75,000 miles a year. She was an elder of the Seneca tribe. And she was a licensed auctioneer. "She had such a diversity of gifts," said longtime friend Monsignor Tom Cahalane of Our Mother of Sorrows Parish. But Hobday would be the first to give credit for her many talents to another. "Often we take all that we have for granted," Hobday wrote in her essay, "Four Days of Thanksgiving." "Or, we think that we have earned everything we have. We fail to see, as we would if we were really observant, that the things we have — especially the important things — are indeed gifts that we have received from the earth, from each other, and, when all is said and done, from God." Hobday shared her gifts freely and enthusiastically. Even in death, Hobday continued to give of her self. After her death on Palm Sunday, April 5, following a period of declining health, her body was donated to the University of Arizona. She was 80. A memorial Mass for Hobday is scheduled for 6:30 this evening at Our Mother of Sorrows, 1800 S. Kolb Road. The mysterium tremendum shone in your words and actions. Hobday was born in Texas — where she was baptized Joan — and raised in Colorado. Her mother, Esther, was a full-blood Seneca-Iroquois who converted to Catholicism. Her father, John, was a strict Southern Baptist and half-blood Seminole. In her later writings, Hobday credited her parents for her religious upbringing and her childhood desire to become a nun. Of her mother, Hobday wrote in her book, "Stories of Awe and Abundance": "She made a prayer out of the way she stirred oatmeal. Doing things prayerfully." Each January, Hobday "celebrated her birthday in a unique way," Cahalane said. "She always turned her birthday into a celebration of her parents, a thanks-giving of her parents." 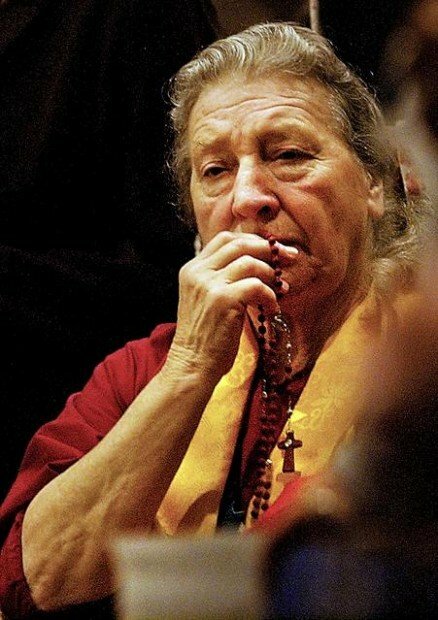 Hobday took her vows in 1955 and spent much of her career ministering to Catholics living on reservations across the country. At each outpost, she lived the life of her flock, driving her Jeep to the pueblos and rural communities in which she served. In her teachings, lectures and books, Hobday combined her American Indian heritage with her Christian beliefs. "She was very grounded in her culture. Reconciling the gospel with her Native American culture was something that she did admirably," Cahalane said. Hobday served in Tucson for several years in the late 1970s and returned in 2004 as a member of Blessed Kateri Tekakwitha Native American Parish on the Pascua Yaqui reservation in South Tucson. "She was an extraordinary woman, very gifted," Sister Maxine Hart said. "She was an eloquent speaker and could really impart the message of the Lord to the people. She could hold an audience in the palm of her hand." Though Hobday's spiritual teachings were age-old, she was a progressive thinker who wasn't afraid to challenge religious practices for the betterment of the church. "She was an outstanding, different religious woman. She didn't walk to the same drummer as most religious women do," Sister Jeanette Mariani said. "She was very futuristic in how women should serve in the church. She made those (ideas) well known to our religious community as well as parish communities and any communities she was in touch with." In recent years, Hobday suggested ways to attract more young men to church ministry, and she was eager to create individualized programs for novitiates instead of the traditional one-program-fits-all approach, Mariani said. "She truly loved our religious community. She truly loved the Catholic Church," Mariani said. "Even though she oftentimes was at odds with its teachings, she was always very faithful." Sister José Hobday was an international speaker and author of several books on spirituality. "Simplicity is bracing and requires a certain spirit of adventure. Real spirituality involves some risk." From "Simple Living: The Path to Joy and Freedom"
"No one influenced my prayer and spirituality more than my mother and dad. My mother taught me to pray in a playful way. As a result I love to play with God, as if I were a child playing with my parents. I like going to a playground, getting in a swing and swinging high, because I believe God lives in us through the joy and power we sense when we swing high." From "Stories of Awe and Abundance"
"In spring and summer I frequently pray while walking in cemeteries. I got in the habit of doing that in Arizona, where it is dry and there isn't much grass, except in the cemeteries, which are watered and maintained. As a result I learned to pray with the dead. That's a great way of praying — in the presence of the dead. The cemetery I walked in was green and grassy. It was all mine. Rarely did anybody invade my meditation place."